There are, literally, probably 1 million different dog leashes out there. There are stylish leashes made of fun fabric patterns, colorful cotton rope leashes, leashes made of climbing rope, traditional nylon webbing leashes, leashes you can snap around your waist, and much, much more. 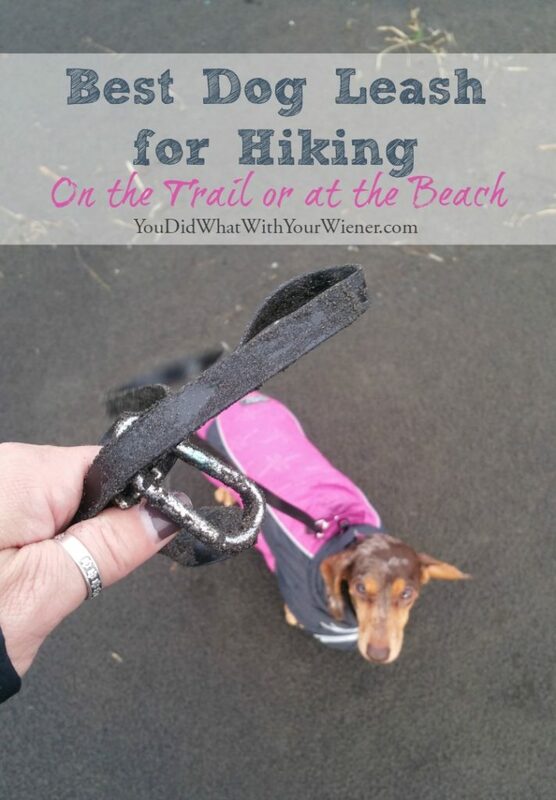 So what kind of leash is best for hiking with your dog? That answer is actually pretty simple. At least it is to me. 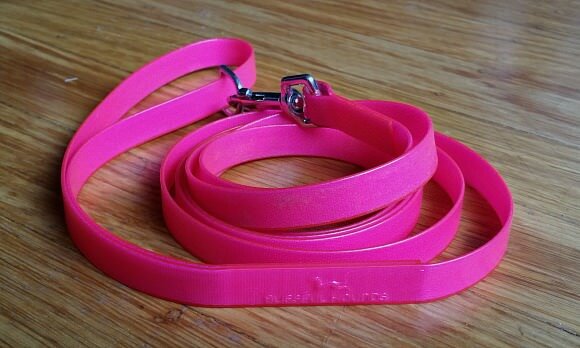 Biothane leashes! What is a Biothane Leash? Never heard of Biothane? Think of the name as the “Kleenex” of the dog-leash world. Biothane is actually the brand name of the webbing material made by the Biothane Coated Webbing Corp. It’s basically a polyester webbing with a TPU or PVC coating that makes it more durable, waterproof, and easy to clean. While, technically, a leash is not “Biothane” unless it’s made using materials sold by this particular company, there are several nylon-coated webbing leashes out there that are either referred to as a “Biothane” or just “coated webbing” leashes. So, Why is it the Best Leash for Hiking with a Dog? Biothane leashes are the best because the material will solve all of your grungy leash problems. To demonstrate, I took ours to the beach. We usually hike in the woods but, believe me, nothing puts a leash to the test like wet, gritty sand that gets into every nook and cranny, dead stuff on the beach, and salt water. The beach is the only place I let Gretel “off leash”. Really, I let her run around to hear hearts content dragging the leash behind her. If you’re ever tried to catch a short, rabbit-fast dog then you will understand why I leave the leash attached (in case you don’t, it’s so I can stomp on it to stop her). As you can imagine, she drags the leash through everything and it’s a total mess afterward. There is no more rigorous test for a leash than this. Ha, ha. See how yucky it is afterward? This is why Biothane leashes are so amazing: they are waterproof and easily clean off with a dunk in water or wipe with a wet towel. There are several other great reasons to love Biothane leashes too. Coated nylon webbing leashes are more comfortable in the hand than uncoated-webbing leashes because they have a smoother surface. Wet and dirty plain webbing leashes can feel like sand paper. The thicker, softer Biothane is made to mimic the feel of leather, which makes them a great vegan leather alternative. They are also very durable and often look brand new even after a few years of use. You won’t have to buy a new leash every year (unless you want to of course). I won’t ever use anything else for hiking ever again. I’m serious. I have head a couple of people over the years say that they don’t like Biothane leashes because it felt slippery to them when wet but I’ve never had an issue with that. So what are my favorite Biothane, or coated Nylon webbing, leashes? So you’re convinced that Biothane leashes are the best and you want to buy one. But where do you find one? Except for a couple of larger, mainstream companies, it’s mostly smaller, handmade shops that sell Biothane leashes. Below are some of the best and most reliable places to get one of these leashes that I have found. The first Biothane leashes I fell in love with were from Dog Walkies. “They actually are all the things they claim they are. The rain beads off these Dog Walkies Beta Biothane leashes like water is afraid them. They don’t soak in any moisture at all. The texture of the material makes it easy to keep hold of the leash… A quick wash with soap and water and they looked as good as new. The hardware is high quality and sturdy and for those of you that live near an ocean, it’s salt water safe. Go read her review to learn more. Since our weather in Seattle is wet (and muddy) most of the year, these became my go-to leashes for everyday use too. I would have never bothered to look for anything else but I lost our first Biothane leashes in a paddleboarding “accident” (no one was hurt – it was minor except for me crying inside because my favorite leashes ever ended up at the bottom of a lake). I tried to replace them right away. Note: If you are at all concerned about the leash slipping (like I said a couple people have mentioned over the years) this brand, or a leash made with the same material, is for you. It’s thicker, softer, and textured. I honestly feel like I’m holding a leather leash. Unfortunately, the owners of Dog Walking took a break for a while so the leashes weren’t available. I went back using our old nylon webbing leashes but wasn’t happy about it. I searched and searched for a replacement but there weren’t many on the market. The ones I could find were wider than 1/2″ and/or the leashes were shorter than my preferred 6′ length and/or the hardware was too heavy and bulky for a 12 lb little dog. But then I discovered Blissful Hounds leashes. These leashes were everything I was looking for and more! They were the width I wanted, with small hardware, and were 6 feet long. The best part was that, although the texture was smoother than my previous leashes, they were about half as thick and light as a feather (but still super strong). Unlike most of the coated nylon webbing leashes out there, the ones from The Blissful Hounds are “welded” together. That means there are no sewn parts to gather dirt, or unravel, and no rivets to weaken the leash and tangle in fur. I did end up getting some replacement leashes from Dog Walkies. I like the heavier feel to them. They are a bit softer too. I end up using the leashes from the Blissful Hounds almost all of the time though. Note: I’ve noticed recently that the Blissful Hounds leash inventory is low. These are still my favorite leashes so I want to leave the link to them but you may have to keep checking back to find what you want. There are other, similar, leashes out there I really like but that aren’t my choice for my small dogs. They would work great for a dog that’s a bit bigger though. The four-foot length works great for keeping dogs close at hand. Bright colors and reflective patterns keep people and dogs visible in low-light conditions. It’s 3/4 inches wide and comes in 4 bright colors. The Talon Clip™ clasp at the end is lightweight and easy to use with one hand (and especially handy to use in cold weather). This is a six foot leash that is 3/4 inches wide and comes in six colors. The moderate-sized, eye trigger snap for easy and secure attachment. If you’re he kind that likes an actual carabiner on the end of the leash, get one of these. The carabiner that attaches to the dog’s collar or harness has an auto-lock feature on it. The leash is 6 feet, 3/4 inches wide, and comes in 11 colors. Biothane leashes, in my opinion, are the best leashes for hiking with a dog in wet or dirty conditions… which is pretty much all hiking scenarios. Have you ever tried a coated nylon webbing leash? What did you think? I love Biothane but I do find it gets slippery when wet or when I have certain gloves on (powerstretch with no griot palm is RIGHT OUT) haven’t tried the textured version, though — that might be better. It is heavier than I like for a just-in-case hiking leash, but for long lines/tracking lines, it cannot be beat. No snagging! No absorbing water! Pretty good feel of the dog! Hmmm… I’ve never had a problem with the leash being slippery. Even the smooth one. However, although I feel like she is going to pull my arm off sometimes, my dog is only 12 lbs. Your dogs are obviously bigger than that 🙂 I think something like the Dog Walkies would be better for you then. It’s thicker, textured, and soft so it would be more “grippy”. Biothane is definitely the way to go for long lines. Yeah, 50 and 70lbs. Not pullers in general, but they have their moments. Thanks for the tip. Great post! I’m so glad you posted this because I always let my Dachshund’s leash drag when he’s “off leash” so I can grab him easily, and I’m tired of constantly cleaning his lead! I’ll have to look into this one! 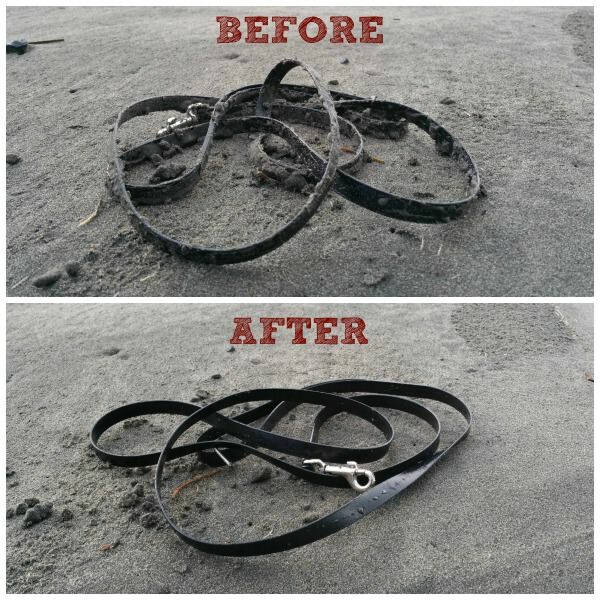 We have been using the biothane leashes since I read about them from this blog a couple of years ago and we LOVE them. We especially like them for pet therapy work. When we go into a nursing home or hospital setting I wipe the leash down with a disinfecting wipe and again when we get back in the car. Thank you for the recommendation. I never thought about that aspect. Good to know. I love the colors of these leashes. I have mostly black and brown leashes, which get lost in a pile when I don’t put them away. I also use EzyDog leashes – the shorter ones that keep my bigger dogs standing by my side. With reactive dogs, these have been a blessing. I can’t use “short leashes” since my dogs are only a foot of the ground. Ha, ha #smalldogproblems. I do like the EzyDog brand though. I agree! We have a 9.5 pound mini. My husband is 6.5 feet tall, so we need as much leash as we can find. (Yes- it’s hysterical to see him walking her! 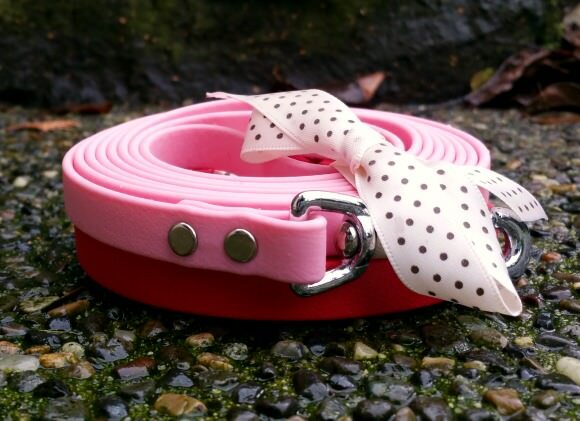 Even better that her collar and leash are hot pink!!) I am so happy to have found this site. We knew she needed more stimulation and exercise, but since she’s our first Doxie, we’ve been hesitant in what we let her do. Glad to know we can let her be more adventurous. I love love love my biothane leash. But it is a 6 foot leash, and I just find it too long in a lot of situations. I need to get a 4 foot one. They really are the best things for wet weather. My dogs also have biothane collars, actually, which are wonderful. We just use our regular leashes for walking. They don’t get all that dirty, just wet sometimes but we hang them up and they dry fast. We use the biothane for tracking and nose work. It’s great for tracking because we have the rivets placed where we need to know how far the dog is from us, and they clean up so well. We also need them to glide through the hand and like the slippery feel. Never heard of the other textures. Ours come from http://palominelines.com/ They ship out almost the same day and we love them. That’s cool to know about the use of rivets in the leash to gauge distance. I never thought of that.